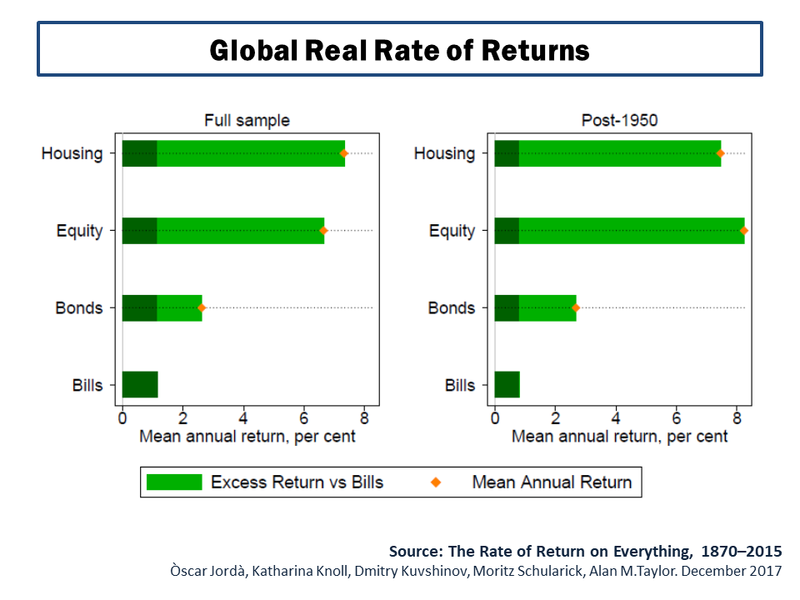 A recently published paper, called “The Rate of Return on Everything, 1870–2015”, looks extremely interesting. The authors – Òscar Jordà, Katharina Knoll, Dmitry Kuvshinov, Moritz Schularick, and Alan M. Taylor – have collected a unique dataset of total returns for equity, housing, bonds, and treasury bills covering 16 advanced economies from 1870 to 2015. The paper calculates real returns across asset classes on a global GDP weighted basis, as per this graph. 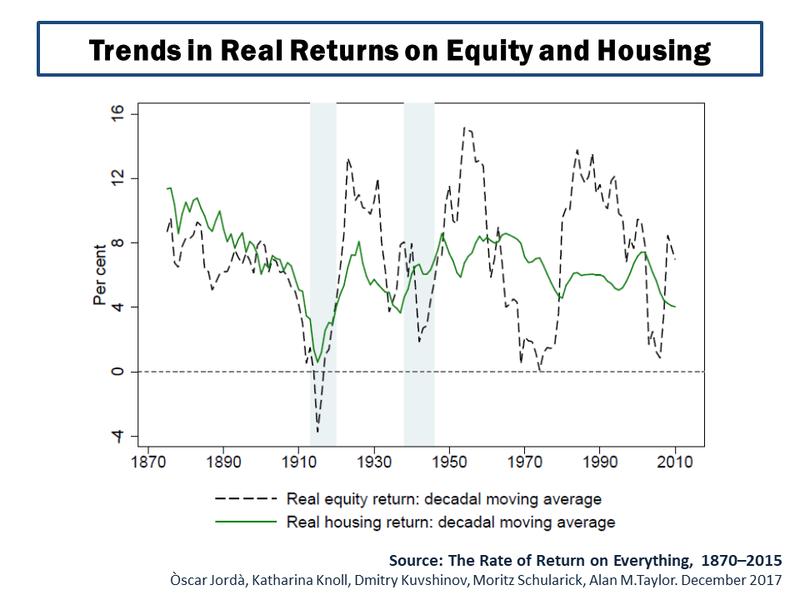 The paper contains some fascinating conclusions, such as housing and equities having similar returns but with housing being considerably less volatile, as per this graph. 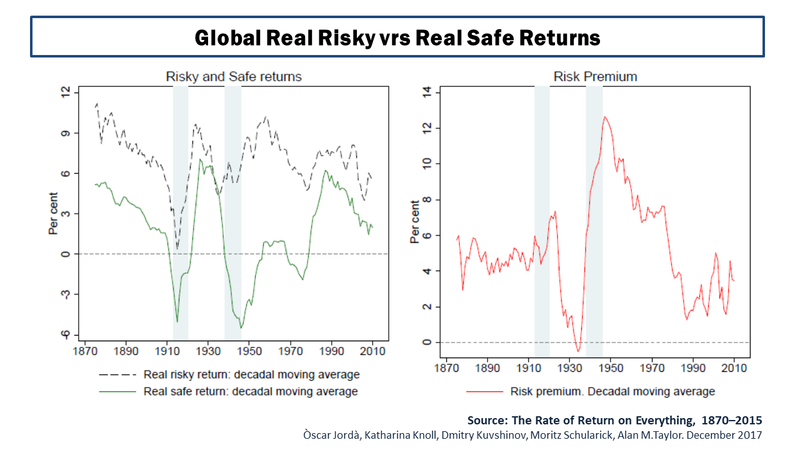 Another fascinating graph is on the risk premium between risky and safe assets, as below. Given the time of year, I haven’t had an opportunity to consider the paper in detail but will hopefully get a chance over the Christmas break (and now back to wrapping presents!!). A very happy Christmas to all who spend any time here. Have a great time and I hope Santa is kind! This entry was posted in Equity Market and tagged Alan M Taylor, Òscar Jordà, business cycle, diversification, diversified portfolio, Dmitry Kuvshinov, equities, equity, Global Financial Crisis, house prices, housing returns, inflation target, Katharina Knoll, low covariance, monetary policy, Moritz Schularick, natural rate of interest, real estate, real returns, real safe asset return, risk aversion, Risk premium, risk-return trade-off, secular stagnation, volatile returns. Bookmark the permalink. Right back at you Eddie, warmest Christmas greetings and here’s to a healthy happy 2018.